Asbestos Coatings offers the most cost effective alternative to the removal and replacement of asbestos. The procedure we offer avoids the inconvenience and costly downtime associated with the replacement of asbestos. No disruption to the use of the building. A completely water based and truly environmentally friendly system. Extension of the service life of Asbestos structures. Significant reduction of roof temperatures resulting on savings in building cooling costs. Government and Health & Safety Approved APAS Cert 1720/2. Fully Licenced and Insured with a 15 year Warrenty. 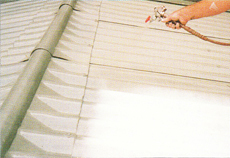 From residential houses to commercial buildings, Asbestos Coatings is a name you can trust! 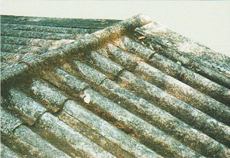 Asbestos surfaces undergo a weathering process after many years of exposure and a loose surface layer develops which, on roofs, becomes colonized with dark coloured lichen. The lichen attacks the cement causing exposure of the asbestos fibres. The surface becomes unstable, the asbestos sheeting is weakened and the darkened colour causes a substantial increase in roof cavity temperatures. 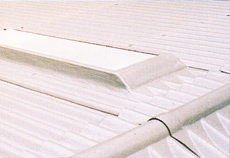 The traditional process for coating asbestos roofs was firstly clean the roof with high-pressure water to remove all lichen and loose asbestos fibres. This procedure however, was banned on health grounds, creating a need for a system that could be applied straight to the degraded asbestos without disturbing the surface. The unstable nature of weathered asbestos surfaces is a cause of some concern in the community and the Fibroseal System has been developed to minimise the danger of hazardous airborne fibres and provide an attractive durable finish. The binding and encapsulation of asbestos fibres. Avoiding costly downtime associated with replacement of asbestos. A significant reduction in roof cavity temperatures resulting in savings in building cooling costs. An extension of the service life of asbestos structures. Provides a rejuvenated appearance in a range of decorative colours. Through extensive research and development, Crommelin developed Fibroseal Primers. The primer soaks through the lichen and degraded asbestos down to the sound base material, binding these unstable elements. Fibroseal Topcoat is then applied to the primed surface to provide a durable, decorative, UV resistant protective coating. Active ingredients in Fibroseal Topcoat also resist the growth of moss and lichen.